Last year, we blogged about Our Gender Revolution, an initiative from the Idaho Coalition Against Sexual and Domestic Violence that centers youth leadership and gender equity in efforts to prevent sexual and domestic violence. This year, Our Gender Revolution has launched the We Choose All of Us campaign and it may be just what we all need right now. 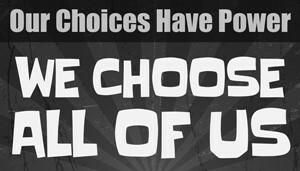 The We Choose All of Us campaign illuminates what it means to bring communities together to create change that is beneficial for everyone, not just some of us.